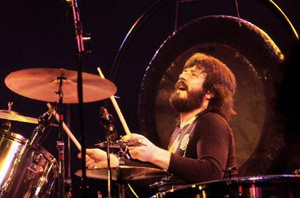 At the annual Classic Rock & Roll Of Honour Awards held on Monday night at the Park Lane Hotel in London, John Bonham was awarded the Tommy Vance Inspiration Award. The award is in recognition of John’s continued inspiration to the world of rock music and was fittingly presented to John’s sister Debbie and mother Joan. The evening was a star studded affair attended by Jimmy Page, Pete Townshend, Ron Wood , Brian May , Joe Perry , Jeff Beck, Paul Rodgers, Iggy Pop, Slash, Tony Iommi , Ginger Baker, Chrissie Hynde , Carl Palmer of ELP and members of Iron Maiden, Anthrax, Anvil, Marillion, ZZ Top, Uriah Heep and Mott the Hoople. well overdue, but i guess Geoff Barton got a bit overexcited when in his initial write up on the Classic Rock Magazine website he claimed that Bonzo was there to collect the award…one could have only wished.